Do Bad Dogs Get Cancer? Turbo and Boxster are the very best of friends and they play regularly together. When Boxster goes over to Turbo’s house to invite his buddy out to play, he’s taken aback when Turbo declines, having no energy. Boxster urges him to go to the doctor and Turbo reluctantly agrees. After running some tests and examining Turbo, the doctor tells him that he has some moles on his legs and stomach that are cancerous and that he’ll require surgery to remove them. Understandably, Turbo is upset over the news and asks Boxster if he got cancer because he was a bad dog. Boxster tells him that bad dogs get time outs, not cancer. Boxster appears to be a very well informed dog when it comes to cancer, thanks to discussions with his next door neighbor dog, Carrera, who had also battled cancer. Boxster informs Turbo that cancer is not contagious and they talk about different treatments – chemo and radiation – as well as remission. Boxster reassures Turbo that he’ll be there to support Turbo throughout his battle. Do Bad Dogs Get Cancer? by Patricia A. Brill, with illustrations by Curt Walstead, is a charming picture book for children where the two protagonists are dogs. Using well-crafted and colorful illustrations, the book deals with a very difficult subject matter: cancer. Brill has chosen her words carefully; they get the message across, yet in such a way that a young child will understand without feeling threatened. Most children relate to animals, especially dogs, and choosing dogs to be her protagonists was perfect. Pets are considered to be a part of the family and children should be able to relate to illness in pets. Walstead’s illustrations are large, colorful, contain just the right amount of detail to keep young children engaged, and serve to complement the author’s text perfectly. What is especially poignant about the story is when Turbo asks whether he got cancer because he was a bad dog and Boxster replies that bad dogs get time outs, not cancer. That is about as perfect a response as one could make. 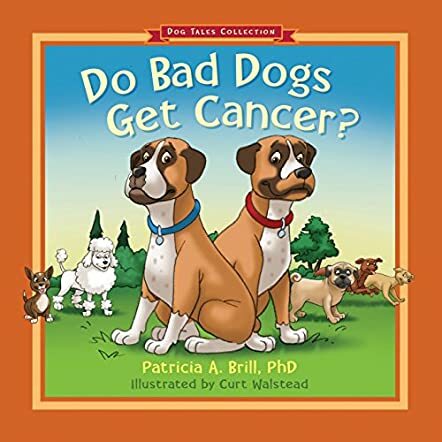 Serious subject matter well-handled with simplistic yet colorful illustrations make Do Bad Dogs Get Cancer? the perfect go-to book for teaching a very important life lesson.